This CD was co-created with a gifted fourth generation musician named Randell. Listening to him play his Native American flutes touches the heart and soul. His music has been said “to paint beautiful pictures within the heart” inspiring others to find that place within themselves called home. With Spirit guiding us; a magical symphony was created to support the guided meditations. Enjoy the Guided Journey home as the angels, ancients and spirit guides lead you to the place of stillness within. 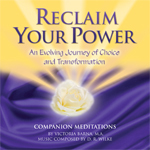 Select meditations from Victoria’s book Reclaim Your Power An Evolving Journey of Choice and Transformation have been recorded to enhance your meditative experience. Find a quiet place and journey within to the place of stillness where your answers to your questions can be found. Mother-Father God/Spirit/Source/Creator/All That is One; whatever you name the ONE Source is always with you. Rediscover the creator you are and your connection with ALL. We are ONE and in our ONENESS all is possible. PEACE begins within…Enjoy and Remember! 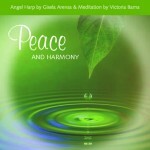 Peace & Harmony – Soothe your soul after a hectic and stressful day with a 15 minute guided visualization by Victoria accompanied by Gisela and the Angel Harp. Feel the tension and stress gently leave your body. Enjoy an added bonus of 15 minutes of Angel Harp instrumental. Create Joy – The beloved energy of Mary Magdalene helps you feel energized and happy through a 15 minute guided visualization with Victoria accompanied by Gisela and the Angel Harp. Let the giggles and laughter emerge. A real “pick me up” when you feel overwhelmed. 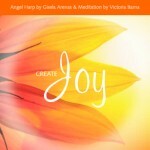 Create Joy reminds you how precious you and life are and how powerful you are as creator! Enjoy an added bonus of 15 minutes of Angel Harp instrumental.